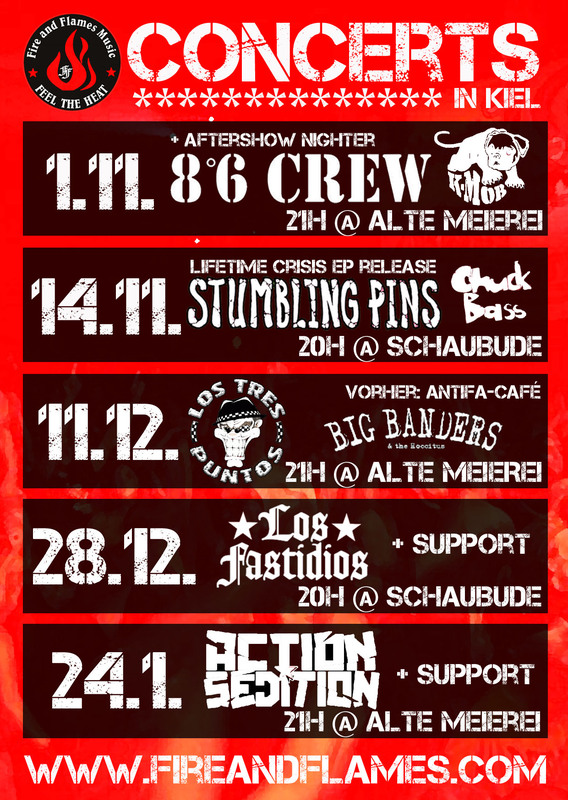 Fire and Flames Music presents and really is looking forward for the local show of The Offenders, masters of antifascist hooligan reggae from Berlin (Italia), and the good old Big Banders from the neighborhood on friday, february 20th at Schaubude Kiel. And be sure that the night won‘t be finished until we‘ve danced it away to the groovy tunes of the Reggae Twins in conclusion. See you on the dancefloor rude boys‘n'girls! Never trust an event notice of Fire and Flames Music… Because of a fever attack three members of Los Fastidios – officialpage are not fit to travel this weekend. The band unfortunatly has to delay their last gigs of the year into the new one. A blessing in disguise: It’s only five days more that you have to wait for their show at Die Kieler Schaubude originally announced for this sunday. The new date is the next friday, january 2nd, same place same time but with another support which is not hundred per cent yet. Sorry again that it seems to be a matter of sheer impossibility to have a regular FF show without chaos, but that’s life. Get well soon comrades of Los Fastidios and see you next friday!! 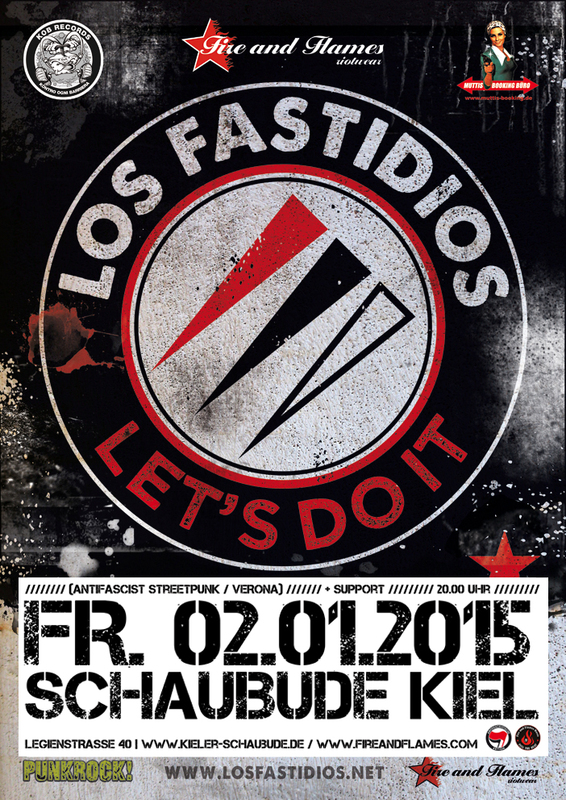 We really can‘t await the upcoming local show of the antifascist streepunk legends Los Fastidios from Verona (Italy) next friday, january 2nd at the Schaubude in Kiel. Be part of one of the first live and loud presentations of their brandnew album „Let’s do it“ just released this month. 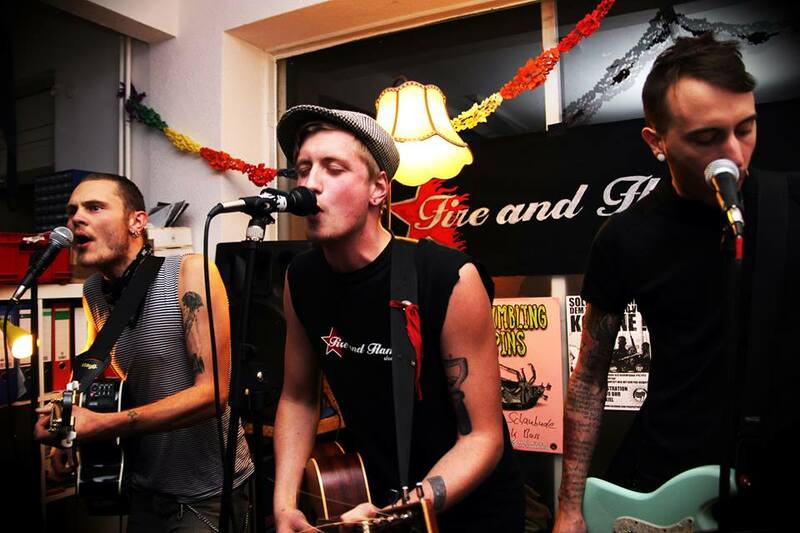 The support will be announced soon, it starts at 8pm and of course this night is presented by Fire and Flames Music. LET‘S DO IT! Make sure to save your copy of the brandnew „Lifetime crises“ acoustic 7″ on location or here! Some of you may remember that we once announced the release date as well as the correspondent gig of the new Stumbling Pins – „Lifetime Crisis“ EP (FFM038) for october 10th. We unfortunatly weren‘t able to keep both because first the band’s new drummer proved authenticity by breaking his arm through a skateboard accident and then we had some trouble with the pressing too. Well, instead we put up a real underground accoustic pre-release show at the FF headquarter last friday and had a great evening with dozens of lovely friends, good noise and tasty catering. Along the way it was also useful to collect some money for the „Weapons for the YPG/YPJ“ campaign and to mobilise for the very succesful Kobanê-demonstration in Kiel the next day. 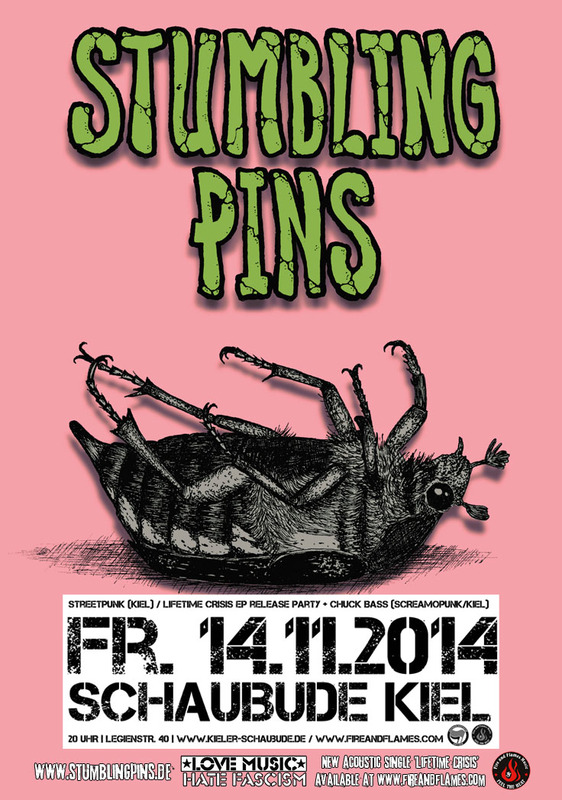 Now we can‘t wait for the the Stumbling Pins EP to be finally out very soon and to meet you again for the second try at Schaubude on november 14th. Watch out! Du browst gerade in den Fire and Flames Weblog-Archiven nach dem Tag 'schaubude'.